Before you begin painting, there is one last important step: choosing a substrate and transferring your design onto it. In this case, I chose 90lb hot press Arches watercolor paper. The poundage of paper refers to how heavy the paper is. The greater the poundage, the more expensive the paper, because there is more material contained in it. However, this does not necessarily mean it is always wise to spring for more poundage — you only need a heavier weight paper if you know that it’s going to need to handle a high volume of water and paint. 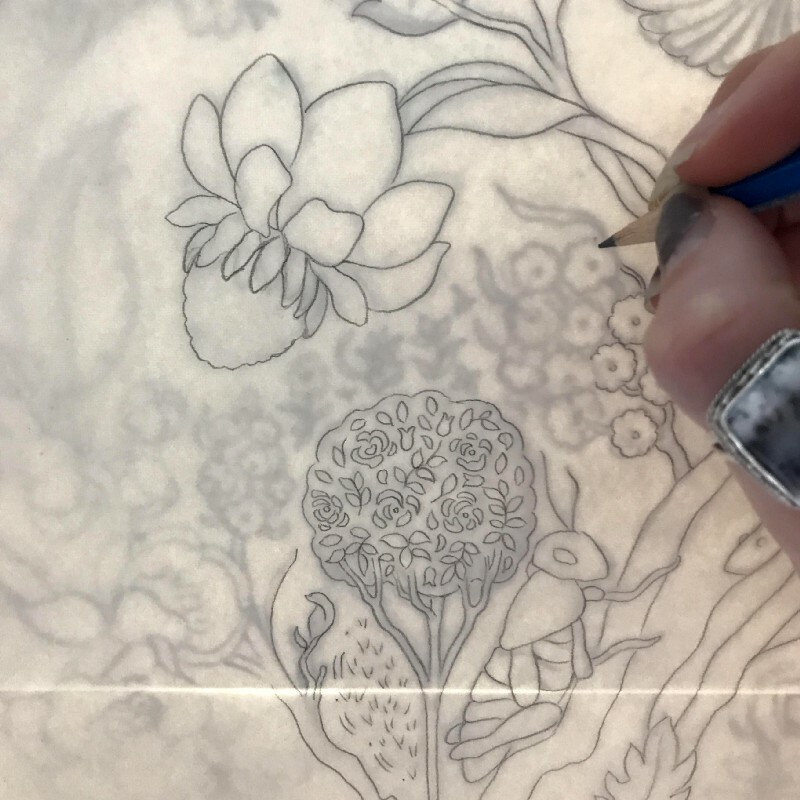 Typically, a textile designer doesn’t need more than a 90lb weight of paper because the style of painting is usually fairly flat and rarely requires a building up of layers. So this is a good place to save some money! The “hot press” refers to hot press vs. cold press, which essentially boils down to smooth vs. textured. Hot press is smooth, and cold press is textured — the amount of which will vary from brand to brand. Arches is generally considered to be a very good brand of papers, although most art stores don’t really have much in the way of brand variety when it comes to buying paper by the sheet anyway. A final note on selecting paper is that watercolor paper can be used for much more than just watercolors. It can handle all wet media, even acrylic and oil — although those require some other preparatory measures. However, it can also be lovely for ink, pencil, etc. if you want something heftier than your basic mixed media paper. 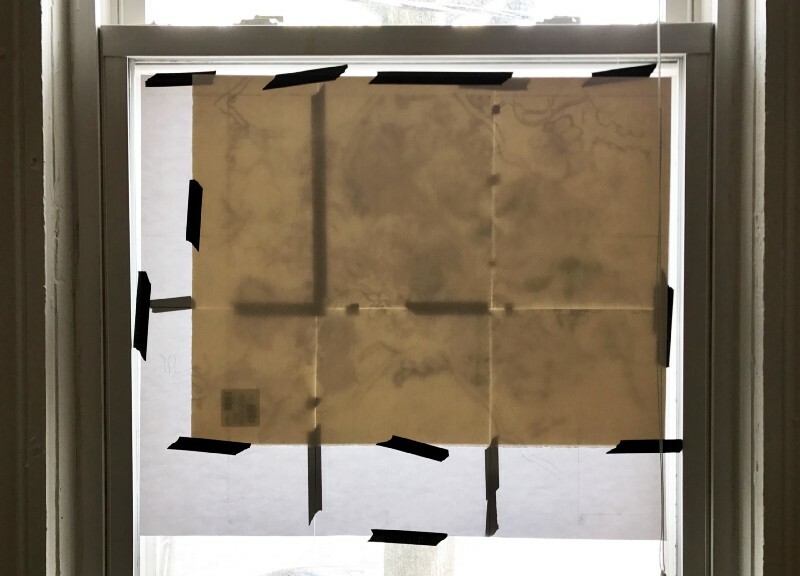 As I mentioned in a previous post, it is ideal to trace on a light box, but if you don’t have access to one, a sunny window and some tape works just as well. The only drawbacks are that a) you would be surprised how quickly your arm gets tired, making it pretty slow-going, and b) you can only use this method during daylight hours. Unfortunately, that’s what I had to resort to in this instance! Transferring your design is a bit tedious, but I find the end result to be very satisfying because it’s the first time you truly see your layout, free of ruler lines, notes, erasures, etc. It’s also a great time to really define your shapes and line work. When you’re sketching you usually draw in sketchy lines, which use multiple smaller lines to make up one larger line. Although it may not seem like it when you’re drawing, you will notice when you’re tracing that this can create some indiscrepancies when it comes to pinpointing where the “actual” line lies. The tracing process is when you make those final, nit-picky decisions that clean up your original sketch. Detail of the transferring process. Finally, after carefully redrawing over everything you just finished drawing, you have a beautiful layout all ready to paint on your substrate meant for doing just that! The transferred design ready to be painted — as you can see, it is drawn very lightly.